Parenting is all about on-the-job training on a learning curve -- so it doesn't hurt to have a bevy of books on a wide-range of topics from breastfeeding and temper tantrums to healthy meals for tots and non-toxic guidelines for your home at your fingertips. Here are six must-have books every parent should read cover to cover and keep on the bookshelf for handy reference! 1. Feeding Baby Green & 2. 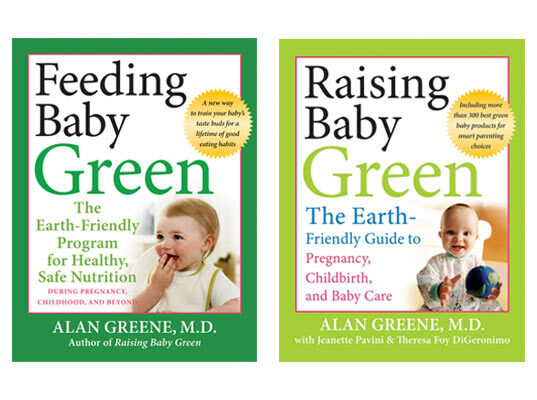 Raising Baby Green by Alan Greene, M.D. We had the pleasure of interviewing Dr. Alan Greene on Inhabitots, and we’re big fans of the books this wise pediatrician writes to guide parents and their children down a healthy green path. Feeding Baby Green tells you everything you need to know about safe, eco-friendly nutrition during pregnancy and childhood, providing tips on meal preparation and the best ways to establish healthy eating habits that start in the womb! In Raising Baby Green, Dr. Greene covers all the bases of eco-conscious parenting in this book which is a vital resource for the many questions parents will have regarding everything from diapers and nursery decor to food allergies and baby skincare. This immensely helpful tome on raising baby from infancy to age two is filled with comprehensive information including proper nutrition for nursing moms, easy, healthy and yummy recipes for babies and tots, managing immunization schedules, dealing with post-pregnancy stress, and much more. The information is easy to digest and locate by topic, and the book is organized in a parent-friendly fashion, so you can flip through it to read about any subject matter you need information about, without having to read it cover to cover. Especially since time is of the essence for new moms and dads! 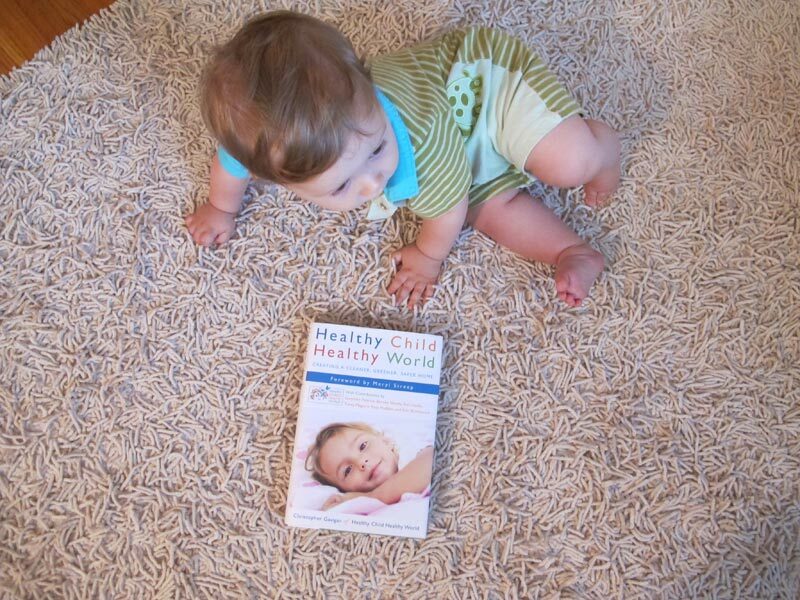 Not only every parent, but every person, regardless of whether or not they have children, should own a copy of Healthy Child, Healthy World. This book is a bible for safe, non-toxic, eco-friendly living that benefits both the world at large and all of the inhabitants in your home. Think of it as a toolbox on your bookshelf, which equips you with all the information you need to clean-up your abode, your diet, and your entire life. It includes handy “copy and carry” guides on everything from pesticide laden produce to making over your cleaning supplies. Everyone from your babies to your pets to your visitors will benefit if you follow the simple solutions and heed the advice in this book. 5. 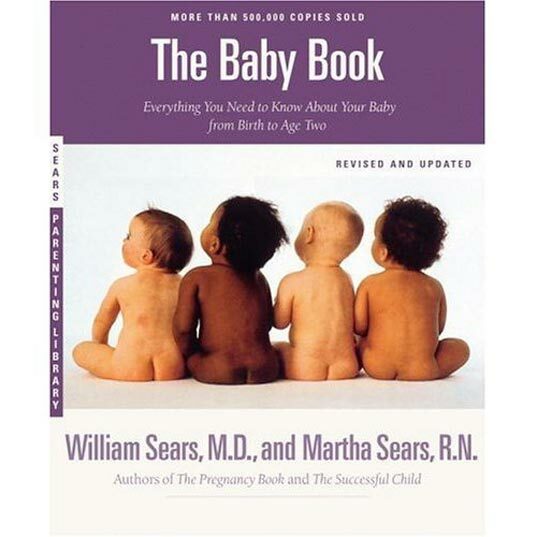 The Baby Book, by William Sears, M.D. and Martha Sears, R.N. Your baby, head to toe, explained. Need we say more? Having this book on hand is like having a pediatrician make a house call whenever you peruse its pages to find an answer you need to a baffling situation regarding your newborn to 2-year-old. The focus of this book is based on attachment parenting, so expect the advice dispensed by the Sears to align with this philosophy. That said, moms and dads of all parenting styles will be enlightened with this information at their immediate disposal. Sleep issues, healthy eating, temper tantrums, babywearing and breastfeeding are just some of the countless topics covered in this book. These amazing parents also share their own personal experiences raising children, making the text relatable as well. Every breastfeeding mom should have the number of a helpful and knowledgeable lactation consultant, as well as a copy of The Nursing Mother’s Companion. Written by a professional nurse and lactation consultant, this guide will help breastfeeding moms overcome the challenges that sometimes accompany the nursing process. From the first time breastfeeding your newborn to weaning your toddler, Huggins offers support and guidance on every page. Food allergies, safety of medications while nursing, breastfeeding positions, and step-by-step, easy to understand instructions make this guide a must-have companion for the numerous nursing sessions you’ll have with your little bundle. 1. Feeding Baby Green & 2. Raising Baby Green by Alan Greene, M.D. We had the pleasure of interviewing Dr. Alan Greene on Inhabitots, and we're big fans of the books this wise pediatrician writes to guide parents and their children down a healthy green path. Feeding Baby Green tells you everything you need to know about safe, eco-friendly nutrition during pregnancy and childhood, providing tips on meal preparation and the best ways to establish healthy eating habits that start in the womb! In Raising Baby Green, Dr. Greene covers all the bases of eco-conscious parenting in this book which is a vital resource for the many questions parents will have regarding everything from diapers and nursery decor to food allergies and baby skincare. 3. 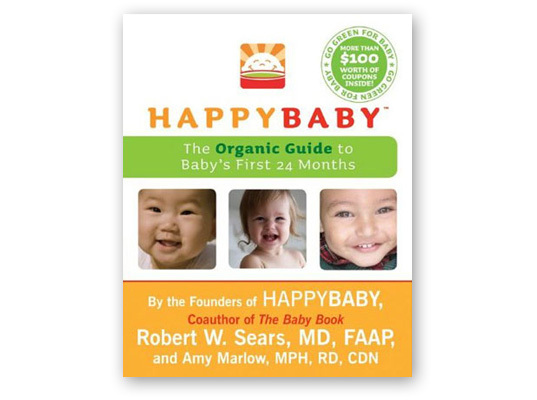 HAPPYBABY: The Organic Guide to Baby's First 24 Months, by Robert W. Sears, M.D., FAAP, and Amy Marlow, MPH, RD, CDN This immensely helpful tome on raising baby from infancy to age two is filled with comprehensive information including proper nutrition for nursing moms, easy, healthy and yummy recipes for babies and tots, managing immunization schedules, dealing with post-pregnancy stress, and much more. The information is easy to digest and locate by topic, and the book is organized in a parent-friendly fashion, so you can flip through it to read about any subject matter you need information about, without having to read it cover to cover. Especially since time is of the essence for new moms and dads! 4. 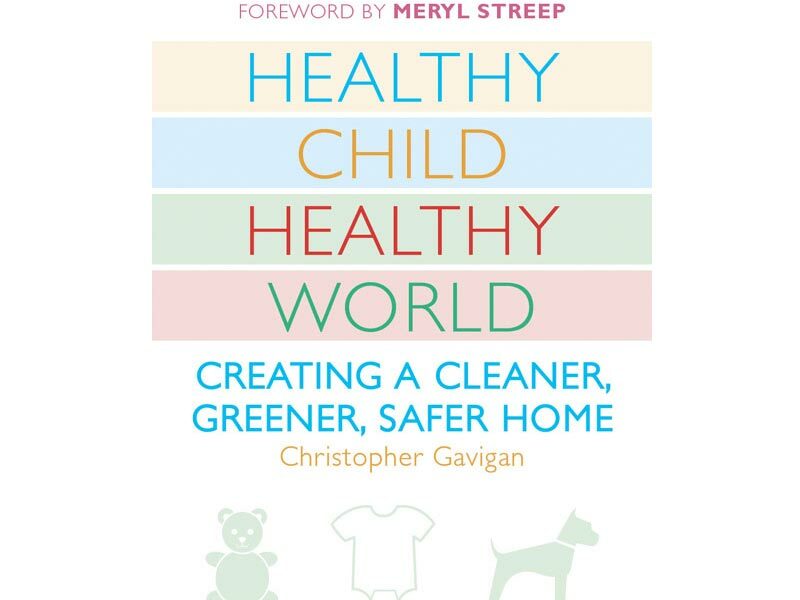 Healthy Child, Healthy World, by Christopher Gavigan Not only every parent, but every person, regardless of whether or not they have children, should own a copy of Healthy Child, Healthy World. This book is a bible for safe, non-toxic, eco-friendly living that benefits both the world at large and all of the inhabitants in your home. Think of it as a toolbox on your bookshelf, which equips you with all the information you need to clean-up your abode, your diet, and your entire life. It includes handy "copy and carry" guides on everything from pesticide laden produce to making over your cleaning supplies. Everyone from your babies to your pets to your visitors will benefit if you follow the simple solutions and heed the advice in this book. 5. The Baby Book, by William Sears, M.D. and Martha Sears, R.N. Your baby, head to toe, explained. Need we say more? Having this book on hand is like having a pediatrician make a house call whenever you peruse its pages to find an answer you need to a baffling situation regarding your newborn to 2-year-old. The focus of this book is based on attachment parenting, so expect the advice dispensed by the Sears to align with this philosophy. That said, moms and dads of all parenting styles will be enlightened with this information at their immediate disposal. Sleep issues, healthy eating, temper tantrums, babywearing and breastfeeding are just some of the countless topics covered in this book. These amazing parents also share their own personal experiences raising children, making the text relatable as well. 6. The Nursing Mother's Companion, by Kathleen Huggins, R.N., M.S Every breastfeeding mom should have the number of a helpful and knowledgeable lactation consultant, as well as a copy of The Nursing Mother's Companion. Written by a professional nurse and lactation consultant, this guide will help breastfeeding moms overcome the challenges that sometimes accompany the nursing process. From the first time breastfeeding your newborn to weaning your toddler, Huggins offers support and guidance on every page. Food allergies, safety of medications while nursing, breastfeeding positions, and step-by-step, easy to understand instructions make this guide a must-have companion for the numerous nursing sessions you'll have with your little bundle.